We previously annouced that Ana was casted in a brand new project called Corazon. Yesterday the director announced via instagram that the movie has been nominated for The Tribeca X Awards which will announce its winner later this month. The men who pay Elena Ramirez for her body don’t know she’s dying. With nothing left to lose and a family that needs her to live, she decides to leave Santo Domingo and follow the only doctor who offers her hope on a near-impossible journey to New York. 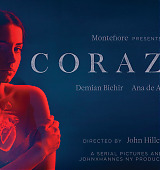 Corazón, a startling film based on a true story, features Academy Award nominee Demian Bichir and actress Ana de Armas and is directed by John Hillcoat. Ana is filming a new project called ‘Corazón’. It is directed by John Hillcoat and her character name is Elena and has brown eyes and darker hair!